When the fast pace of city life, towering skyscrapers and air-conditioned shopping malls all becomes too much, escape the concrete jungle and head to the real jungle, within the MacRitchie Reservoir Park. One of Singapore’s most popular nature parks contains primary rainforest and is home to more than 840 flowering plant and 500 animal species. The highlight is the HSBC TreeTop Walk, a free-standing 250m long suspension bridge which gives you a bird’s eye view of the plants and animals in the rainforest canopy from its 25m high position. 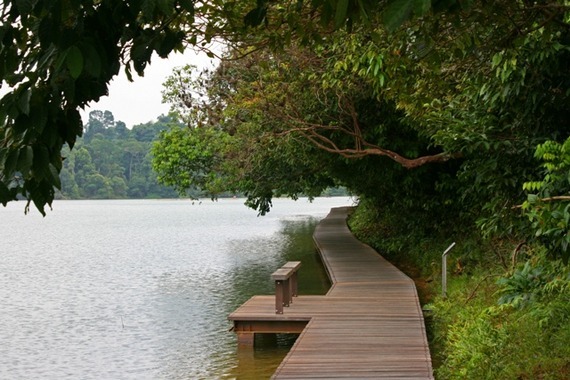 I first visited MacRitchie Reservoir Park when researching my book In Singapore: 60 Fabulous Adventures in the City. Here I write about it for 10Best.com. This entry was posted in 10Best.com, Web and tagged Singapore on August 20, 2012 by Marianne @ Mum on the Move.